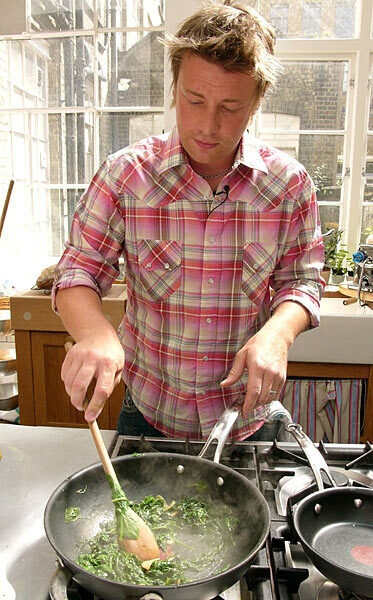 I am hooked on Jamie Oliver at the moment -- following his prime time show "Food Revolution"and catching up on past episodes of "Jamie At Home" on the Food Network. On the menu - this week - at our house, Zucchini Carbonara. 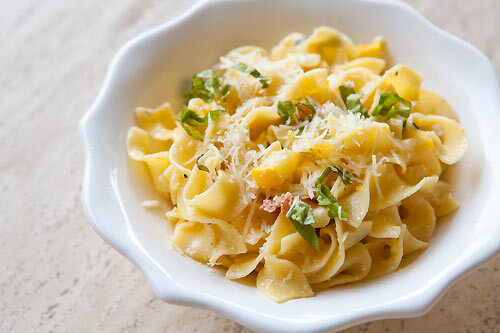 “Carbonara is a classic pasta sauce made with cream, bacon and Parmesan and is absolutely delicious. Try to buy the best ingredients you can, as that's what really helps to make this dish amazing. I'm using a flowering variegated variety of thyme but normal thyme is fine to use. When it comes to the type of pasta, you can serve carbonara with spaghetti or linguine, but I've been told by Italian mammas (who I don't argue with!) that penne is the original, so that's what I'm using in this recipe. i'm going to make this soon ~ i have fresh squash just begging to be served "Jamie" style. I think you should be Jamie's photographer because your food looks ten times better than his cookbooks. Thanks for posting this great summer pasta recipe. I'll definitely be preparing it soon. Good to "see" you again.